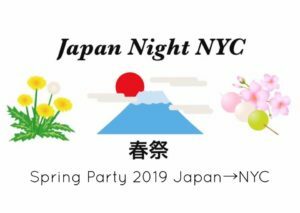 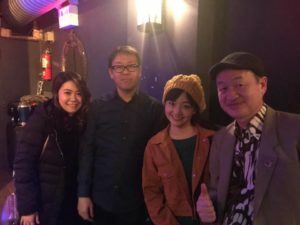 Mack joined Japan Night NYC “Spring Party 2019” with singer Hanako Morikawa and guitarist Nobuki Takamen on 16 March 2019 at The Parkside Lounge (317 E Houston St, New York, New York 10002). 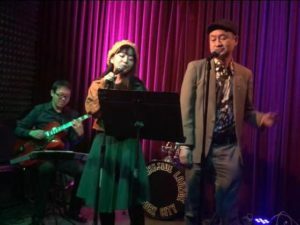 Mack and Hanako sang Japanese Anime (Doraemon, Ponyo, My Neighbor Totoro, Gue Gue Gue no Kitaro) and Wings to Fly accompanied by guitarist Nobuki. 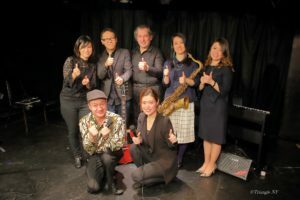 As usual, Mack made English accents impression, but this time incorporated it into Wings to Fly. 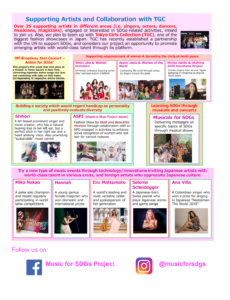 During the show, Mack promoted Music for SDGs Project to enhance public awareness on SDGs through musicals and music events, as a project director. 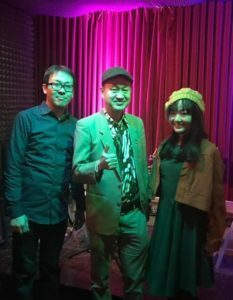 Aya Takeuchi, Assistant Director, also joined the event. 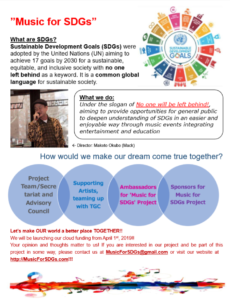 Music for SDGs one-page flyers were delivered to interested participants.